Today is the hottest day I have felt in a very long time. Yes, Hawaii is warm. We are in the tropics. But it is warm not HOT. Today is hot. Totally, unforgivingly, unpleasantly hot. The remnants of a tropical storm passing north of the islands have cut off all the tradewinds that keep the islands cool. Without them? Sticky, humid, and way to hot air gets trapped and we run for the hills…well, we actually run for the AC. 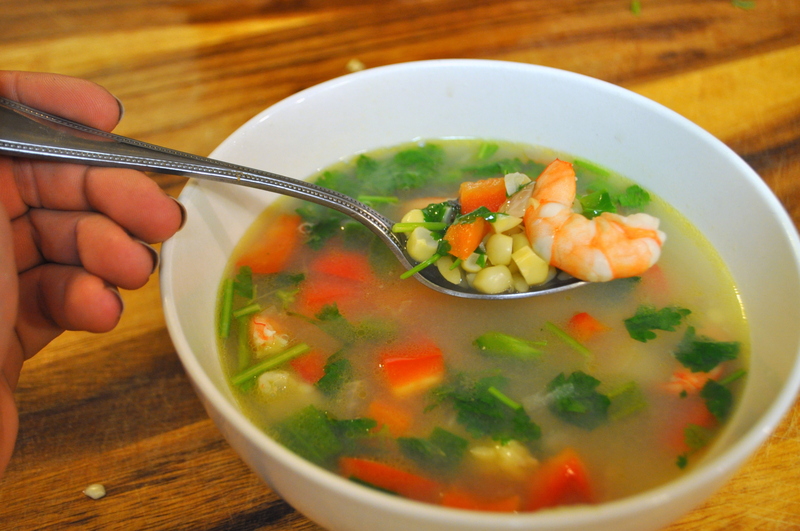 The broth for this soup is a great way to use up scraps you ordinarily would throw away. The corn cobs and onion ends get repurposed and reused to make a flavor packed vegetarian broth. I like to make extra and keep it in the freezer to use as a quick flavor boost in all sorts of dishes. To make the broth, just boil the corn cobs with any veggies you like in a large pot filled with salted water. When the broth has reached the level of flavor you like, take it off the stove, let it cool, strain it, and enjoy it in any of a million delicious ways.